A change of scenery was vital. We needed something to look at besides each other, daily routes, and homework. Sound familiar? With a mini vacay long overdue, we packed up and hit the highway! Research on not-to-distant happenings led us back to Wilmington, NC. We decided to attend a local festival, added a few more activities to the list, and called it an official road trip! We arrived in Wilmington on a Friday afternoon. After settling in, we raced to Wal-mart to purchase essentials (only). We do our best to save money-especially on trips. Who doesn't like to do that right?! Go here for some of our money-saving travel tips! Saturday was filled with activity! Our first stop was the N.C. Fort Fisher Aquarium. We extend a huge thanks to them for sponsoring our visit! It is such a beautiful, family-friendly place and engaging staff members make it extra enjoyable. Seeing that my parents and kids were visiting with me, I appreciated the accessibility of the establishment. There were stairs, elevators, rails, and ramps throughout. Loved it! Here are a few of the wonderful things we saw! By the way, I LOVE the way the aquarium enforces their rules in one of the pics below! We didn’t get a chance to see the The Dive Show, but check out my brave girls touching crabs and sharks! Winning! In addition to admiring underwater creatures, visitors can now have face time with dinosaurs without becoming a meal! The aquarium’s new animatronic dinosaur exhibit is a must-see! My girls were ecstatic! 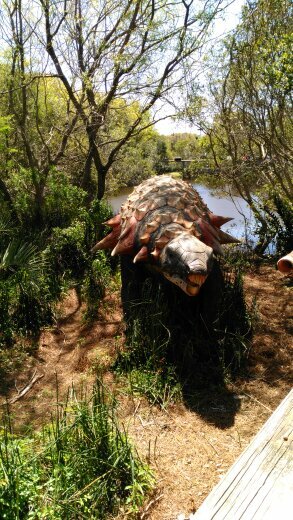 The dinosaurs move, roar, and have a few surprises for passersby. The ferry was our ride back to town but the wind was ruthless! Our festival visit was also short-lived because of it. We hurriedly found food, stuffed our faces, and fought strong gusts as we attempted to look around. The winds were so powerful that vendors physically held on to their tents to prevent take-offs! Besides food, the only purchase we made at the festival was this bracelet. It’s made from a 1935 bent spoon! Isn't that amazing?! Sunday, our last day, was a combination of happiness and shock. We had a wonderful time, couldn’t believe it was over, and didn’t want to leave! A nearby breakfast spot fed us heartily in preparation for our drive back home. It was well worth the long wait and the costs! Overall, this trip was a thumb’s up! It was our first Airbnb experience and we couldn't have been happier (Thanks Lisa!). We can’t wait until our next venture! Be sure to head over and check out the trip footage in its entirety here. Hang out on our Youtube channel Thrillerdise to catch up on our other family shenanigans.